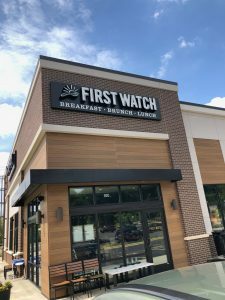 Smarties, Have you every heard of the restaurant First Watch? One just opened up in Providence Farms Center just slightly north of the Waverly shops and it is AH-MAZING. I have eaten there three times and each visit, there is a wait. Some people get frustrated, not me — a wait signifies the food is good! And I am here to tell you, the food at First Watch is delicious. I would recommend that you start reviewing the menu as you wait for your table. There are so many mouthwatering choices it is hard to decide. 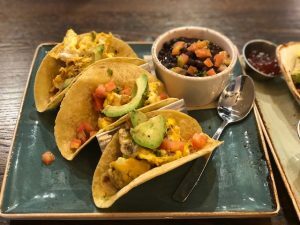 Their menu is divided into Seasonal Items, Classic Favorites, the Healthier Side, Egg-slucives, Omelets and Frittatas, From the Griddle, Power Bowls, Salads, Sandwiches, Juice Bar, Kids, Sides and Small Plates. The longest part of your meal will be making the decision on what to order. Because when the food arrives, the presentation alone has your mouth watering and after the first bite the conversation ceases and the feast begins! 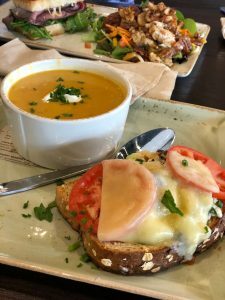 First visit, we ordered the open faced Chicken Salad Melt (made with all natural white-meat chicken with raisins, apples and celery) with a side of the Butternut Squash Bisque (Smarties, add First Watch to the list of Chicken Salad fav’s in the QC! ) and a Roast Beef and Havarti Sandwich with a side of Sweet Honey and Pecan Salad. It was love at first bite! I have to mention the service. The wait staff went above and beyond to deliver us a good experience! From the minute we walked through the door, we were greeted with smiling faces. The waitress was lovely. She was very helpful and accommodating with guiding us through the menu. Her customer service skills were impeccable. I never had to ask for a refill! She was always one step ahead of what we needed. 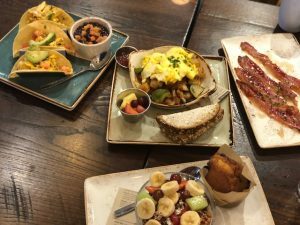 Second visit, we ordered the Million Dollar Bacon, Farm Stand Breakfast Tacos, the Farmhouse Hash and the Sunrise Granola Bowl with a chocolate chip muffin. Their kitchen is pure magic! Each bite was heaven. I ended up rolling out of First Watch that afternoon. Again, the service was fantastic. Our waiter kept our ice teas full, brought us extra lemons and sent us home with chocolate chip muffins. Added bonus, he offered us to-go cups of our beverages. It was as if he was reading our minds! 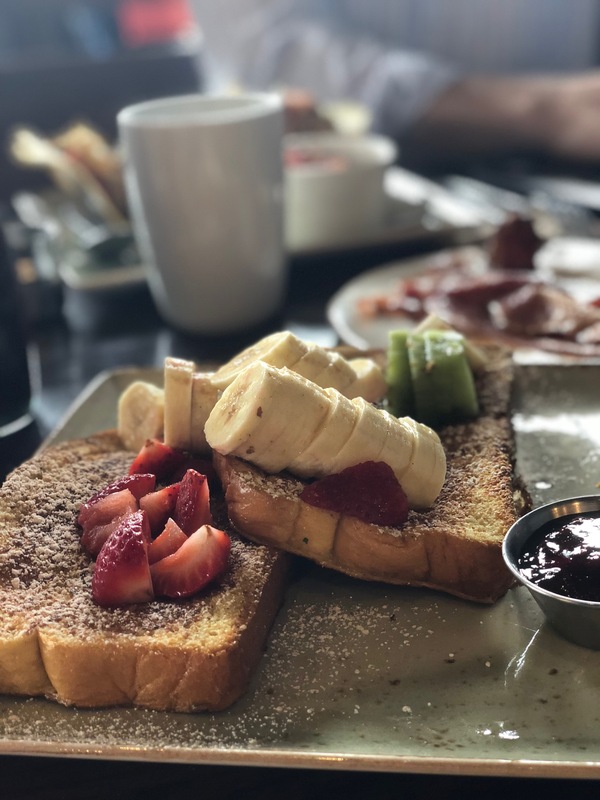 Third visit, we ordered the Floridan French Toast (*feature image) – thick coat brioche covered with fresh bananas, kiwi and strawberries and a repeat of the Farm Stand Breakfast Tacos. Our deal is we order two things and share…. the French Toast was SO hard to share. There was a perfect balance of sweet and savory. Perfection! Not one bite was left on our plates. We had the same waitress as our inaugural visit and she warmly greeted us by saying, “Welcome Back.” She reminded us that she was our first waitress and showed us where we were seated. It is this kind of service that creates a loyal customer! This review is based on the Providence Farms Center location. From the Smarty Health Corner and CEENTA: What is an optical illusion? LOVE this and First Watch!! Soooo good! !